Entries categorized "High Hopes Stamps"
Yay! Today is the Jolly Holiday Release from High Hopes Rubber Stamps. The designers have created wonderful projects using some of the stamps that release today. Hop along to each blog to be inspired! You can start at the High Hopes blog if you'd like to start at the beginning of the hop. There will be a prize (but you won't know where) so leave a comment on each blog to make sure that you are entered for the drawing! The Blog Hop will be open through Midnight EST, Friday, September 5th and the winner will be announced with the next challenge. Now, hop on over to the marvelous Kristine's blog to see the inky goodness she has to share with you today! It's Tuesday, and time for a new High Hopes blog challenge! The current High Hopes challenge is called Ice or Snow. I chose to use the new Penguin's Tree image for my card. I stamped the image on Neenah cardstock using Memento ink and colored it with ShinHan Touch Twin markers. And look at the cute little embossed holly and bow! I made that embellishment with the Sizzix Holly Embosslit. Fun! High Hopes has a wonderful image release taking place on Wednesday, and the designers are doing a few sneak peeks this week using the new images. For today's project, I used Santa's Gift to create this holiday card. I created the fun frame on this card using the newly released Enchanted framelits die, from the Sizzix Prima line. Such a fun, elegant set of dies! I recommend popping on over to the High Hopes blog to check out the rest of the team's peeks for today! Fun stuff! It's Tuesday, and time for a new High Hopes blog challenge! Colors of Fall is our theme this week, so pull out your High Hopes images, and join us! I put together a video sharing the card, as well as the coloring of the image and card assembly. Enjoy the video if you'd like to see this card in more detail. If you have trouble viewing the video here on my blog, you can also find it on my YouTube Channel. Paper: Neenah, Pebbles, Stampin' Up! It's Tuesday, and time for a new High Hopes blog challenge! Buggin' Out is our theme this week, so pull out your High Hopes images, and join us! It's Tuesday, and time for a new High Hopes blog challenge! For the Boys is our theme this week, so pull out your High Hopes images, and join us! It's Tuesday, and time for a new High Hopes blog challenge! Christmas in July is our theme this week, so pull out your High Hopes images, and join us! It's Tuesday, and time for a new High Hopes blog challenge! Blue/Green/White/Cream is our theme this week, so pull out your High Hopes images, and join us! It's Tuesday, and time for a new High Hopes blog challenge! Outdoors is our theme this week, so pull out your High Hopes images, and join us! For my card I chose to use Henriettas Backside and Sm Sunnie, along with patterned paper from Bazzill, Neenah, and the Sunnyside Pebbles 6x6 pad. The images are colored with ShinHan Touch Twin markers. It's Tuesday, and time for a new High Hopes blog challenge! Anything High Hopes Goes is our theme this week, so pull out your High Hopes images, and join us! For my card I chose to use Lucy's Lambs along with patterned paper from the Herbs & Honey BasicGrey 6x6 pad -- so cute! The image is colored with ShinHan Touch Twin markers. It's Tuesday, and time for a new High Hopes blog challenge! Baby/Kiddo is our theme this week, so pull out your High Hopes images, and join us! For my card I chose to use Krissy's Snuggle Bear, along with patterned paper from the Storytime (girl) 6x6 pad line from Studio Calico. It's Tuesday, and time for a new High Hopes blog challenge! Water is our theme this week, so pull out your High Hopes images, and join us! For my card I chose to use Caseys Catch, which made for a cute little summery scene. The image is stamped in Memento ink and colored with ShinHan Touch Twin markers. The patterned paper is from the Little Yellow Bicycle Fern & Forest 6x6 paper pack. I used The Stamps of Life cloud, sun, and wave dies to complete the scene. It's Tuesday, and time for a new High Hopes blog challenge! Patterned Paper (use 2 prints) is our theme this week, so pull out any High Hopes images you have, and join us! For my card I chose to use Choppers Chilaxin' and Small Sunnie, which made for a cute little summery scene. The images are stamped in StazOn ink and colored with Albrecht Durer watercolor pencils. I added a bit of glitter to the ice, lemon wedge, and sunglasses for a bit of sparkle and shine. The patterned papers I chose are from the Simple Stories Homespun 6x6 paper pad. Super cute, and I love the colors! It's Tuesday, and time for a new High Hopes blog challenge! Birthday is our theme, so pull out your High Hopes stamps, and join us! I used the stamp "The Best Things". I decided to cut out the sentiment that comes on the original stamp image so I could use them separate from each other more easily, and I could use the stamped floral frame either vertical or horizontal. Fun! I then added a different sentiment (than what comes in the original stamp image) to the center of the frame. It's time for a new High Hopes blog challenge! This week's challenge topic is a sketch challenge. Visit the High Hopes blog to see the sketch, and play along! It's Tuesday, and time for a new High Hopes blog challenge! This week's challenge topic is Anything That Hops! Join us! For my project, I made an Easter themed pencil treat box that holds four pencils. These pencil boxes are quick and easy to make, and fun to give as gifts. If you'd like to make one as well, I have a template I created a few years ago. To decorate this pencil box, I chose the super cute Small Easter Bunny image. I stamped the image on watercolor paper with black StazOn ink and colored it with watercolor pencils. I added a bit of glitter to the flowers in her hat and on her bow for sparkle and shine. It's Tuesday, and time for a new High Hopes blog challenge! This week's challenge topic is easy! Anything High Hopes Goes! Pull out any High Hopes images you have, and join us! I stamped Lucy on Neenah paper and colored her with ShinHan Touch Twin markers. I used a few colored pencils for details in the grass and wildflowers. I added a dot of Glossy Accents to each wildflower, for a little something different. Speaking of wildflowers, the Texas Bluebonnets have started to show their faces here and there! There should be fields of them blooming in no time! I stamped Patty on Fabriano watercolor paper and painted her with watercolor pencils. I added some glitter glue for a little sparkle and shine. The camera really picked up the shine today... it's not quite so 'silvery' in person. It's Tuesday, and time for a new High Hopes blog challenge! This week's challenge topic is Chevrons, which as crafters we know as the repeating V shaped design. For my card I've used Loungin' Lizzy, colored with ShinHan Touch Twin markers. The designer paper in the background is by Fancy Pants, and features a pretty yellow and white chevron pattern which I've grunged up a bit with brown Distress ink. And speaking of "one of those days", is it Friday, YET!? I sure could use a weekend. How annoying that it's only Tuesday! The current High Hopes challenge is Flowers. I chose to use the new Herbie image for my card. I embellished the card with some Prima flowers with yellow brad centers, Impression Obsession die cut grass, and pretty papers from Pebbles. The current High Hopes challenge is Banners or Flags. I chose to use my favorite High Hopes image, North Woods Stack, and made a little ribbon flag using brown twill. I embellished the ribbon flag with a cute brown button threaded with natural twine. The current High Hopes challenge is all about creating For Someone You Love! I chose to use the new Lucy's Lambs image for my card. I stamped the image on Neenah cardstock using Memento ink and colored it with ShinHan Touch Twin markers. I stamped the image on Fabriano watercolor paper and colored it with Derwent Inktense colored pencils. The designer paper is from the Country Kitchen line by Farmhouse Paper Company. A personal favorite 6x6, for sure! It's been a pretty low-key day around the farm today. I decided would spend part of my day putting together this video for you showing a start-to-finish card. I stamped the image on watercolor paper using StazOn ink and colored the image with Derwent Inktense colored pencils. I used some grass and leaf dies to add details to the scene. High Hopes Blog Hop & Challenge #200! This week marks the 200th Blog Challenge for High Hopes Rubber Stamps. For over 7 years the team has been creating amazing samples using High Hopes stamps, and it has been a wonderful journey. To celebrate, we're having a Blog Hop! 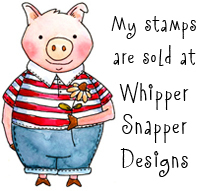 There will be prizes provided by our Sponsors Stamp and Create, Bunny Zoe's Crafts, and One Crazy Stamper, along with High Hopes Rubber Stamps. You should start at the top of the blog hop at the High Hopes Blog. As you hop along each stop, you will find a clue at each stop. Collect each clue to create a phrase. When you are done with the hop, leave a comment including the finished phrase to be entered into the drawing for one of the prizes. In addition, there is another chance to win 1 Free High Hopes Stamp by entering the 200th challenge! Create a card or project using the challenge theme and link your project on the challenge blog. You can participate in the challenge without doing the blog hop (which will enter into the drawing for 1 Free High Hopes stamp). You can also participate in the Blog Hop without entering the challenge (which will enter you in the drawing for the chance at one of the 3 sponsor's prizes). And yes, you MUST use a High Hopes stamp to enter the challenge. For my card, I chose North Woods Stack. I just love those critters, and while I have many High Hopes favorites, I really do think this one is my uber-favorite! The image is stamped in black ink, colored with Prismacolor pencils, and white gel pen used for accents. Jot this down ... you'll need it! Your clue from my blog is "High". Now, hop on over to Kristine's blog, the next stop on our hop! Have fun, and thanks for helping us celebrate! The current High Hopes challenge is SANTA! I thought I would share several of my High Hopes Santa projects, to give you a HUGE dose of inspiration! The first card uses Woodland Santa, a rugged northernly fella if I ever saw one! Here's Fishing Santa dressed in his weekend duds! Tropical Santa, chillin' after he's done spreading all the Christmas cheer! A happy go lucky, Santa Portrait card, dressed up with one of my glittered snowflakes! Santa pulling one of the gang, in the Reindeer Games image. Skiing Santa, clearly out on vacation! Sm Stackable Santa on a gift card holder! Moon Santa decorating a chipoard ornament. Flyin' High Santa on a fancy fold card. Father Christmas Block, on a cute square scalloped card. Christmas Pals, lookin' all cheery and cute! And finally Elegant Santa, wishing you a Holly Jolly Christmas! The current High Hopes challenge is a color challenge ... Red, Green and Blue. I chose to use Penguin Block for my card. The image is stamped in black Memento ink and colored with ShinHan Touch Twin markers. I sponged a bit of brown ink to the edges, to warm up the colors a bit. This is for those of you who were interested in the measurements I used for the Flyin' High Santa fancy fold card I recently shared. This template will show you in Purple where to make score lines on your card base, and Red lines where you need to make cuts. Click on the photo for a larger view. Once you have the folds and cuts made, use this photo to see how to press the card base into shape. I applied a bit of adhesive to the small middle section that's at the top of the card in this photo. The current High Hopes challenge is Anything (High Hopes) Christmas. I chose to use Callie Christmas Kitty for my card. I used fancy Sizzix label dies to cut out the white and black die cut shapes.The paper behind is from the American Crafts Kringle and Co line. Callie is stamped in black Memento ink and colored with ShinHan Touch Twin markers. I used a button from a packet of holiday colored Dress It Up buttons, along with some black and white gingham ribbon. A few punched holly leaves are tucked under the button. I added Studio G glitter glue to the candy canes and ornaments for sparkle and shine. The current High Hopes challenge is to do a Fancy Fold card (anything other than a standard card fold). I chose to use Flyin' High Santa for my card, along with an old Stampendous sentiment stamp. I've been meaning to make this card for some time, so this week's fancy fold challenge was just the inspiration and motivation I needed to actually get it done! From the front of the card, it might not look like a fancy fold, but the side view tells a different story! A fancy fold, indeed! Find all the details of this week's challenge on the High Hopes blog. I hope you join us for this week's challenge! High Hopes Challenge: It's Snowing! The current High Hopes challenge is It's Snowing! Unfortunately, it's not snowing here on the farm, though... boy, wouldn't THAT be fun!? That would take me back to when I was a kid growing up in NE Washington state. There were many Halloween nights spent trick-or-treating in the first snow of the season. Of course, there were also many Easter mornings with eggs hidden in snow, too... We won't be so lucky to get snow here in Texas. On my project I chose to use Candy Cane Penguin. The papers I chose to use on the background are from The Paper Studio (I Believe in Santa) paper pad. I thought the pretty blue and white snowflake print combined with the red and white polka dot print would make a cheerful wintery, and SNOWY, greeting. I added some pretty black velvet ribbon to the card, as well as a snowflake embellishment that I made using an EK Success snowflake punch and a little glossy snowflake gem (from Hobby Lobby). The image is colored with ShinHan Touch Twin markers. I added clear Studio G glitter glue to some areas, and added a bit more sparkle and shine by topping the glitter glue (before it dried) with some Dazzling Diamonds ultra fine glitter. Sparkle and shine, baby... sparkle and shine! High Hopes Challenge: Give Thanks! The current High Hopes challenge is Give Thanks, which really could be interpreted as Thanksgiving, or simply as a thank you card, I think! I chose to use the cute Pilgrim Pair and the oak corner image for my project. The sentiment is from my Turkey Time cling mount set. And by they way, Happy *day late* Turkey Day to my Canadian readers! High Hopes Challenge: Make a Box! The current High Hopes challenge is to make a box. I whipped up this cocoa mix and candy cane treat ensemble using a pillow box. So that I could insert the candy cane, I snipped the end flaps on the pillow box a bit shy of the end of the box so that when they were folded closed they created a hole for the candy cane to fit through. Works like a charm! I chose to use the adorable Snowy's Cup and the Warm Winter Wishes sentiment, along w/ some holiday paper from an older paper stack called Harvest and Holiday, by Debbie Mumm for JoAnn. The current High Hopes challenge is a sketch challenge! I hope you join the fun! For my project, I chose to use the adorable Candy Cane Penguin along w/ some holiday paper from The Paper Studio. The current High Hopes challenge topic is Purple & Orange. For my project, I chose to use this cute fall image called Laurie's Pumpkin Patch. In honor of this week's challenge, I treated myself to some new purple and orange ribbons! *grin* I found these at the local W-mart. I was surprised to see them there -- super cute! There were lots of fall and halloween themed prints as well. I chose designs I can use any time of year. The current High Hopes challenge topic is Buttons and Bows. For my project, I chose to use Dogs Trio Block. The current High Hopes challenge topic is to add pearls or gems to your project. For my project, I chose to use Candy Cane Penguin. I added a few different sizes of pearls to the background, and to add a little visual interest, I used my tracing wheel to create blade tracks on the skating pond. The current High Hopes challenge topic is to add sparkle and shine to your project! That's pretty easy with glitter or gems! For my project, I chose to use SNOW. For sparkle, I added a healthy coating of Ranger's Clear Rock Candy dry glitter. Oooh la la! It adhered perferctly with a 2-way glue pen ... it's not going anywhere! And I wish you could see the sparkle! The current High Hopes challenge topic is to use Red and Green on your project! That's pretty easy, especially with the new holiday images! For my project, I chose to use Elegant Santa, Sm. Open Holly, and Holly Jolly.